I've written a lot about telomeres before. I'm fascinated by these little DNA caps, which shrink as we age. In fact, every time our cells divide, the telomeres get a little bit shorter. If they get too short, they disappear altogether, and then our DNA can begin to unravel. 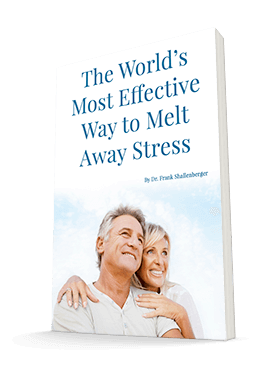 This is a key part of the aging process, as age-related stressors cause our cells to divide. Shortened telomere length has been implicated in a number of age-related diseases, including Alzheimer's, and even the common cold. Since telomere length tells us a lot about how much aging our bodies have experienced, researchers have been studying the relationship between telomeres and a number of health issues. Sometimes they get different results. In this case, a review study can be helpful. Review studies look at a number of different studies on a particular topic and try to synthesize their results. One such study was published last year in the Journal of Affective Disorders. For this review, researchers analyzed a total of 38 studies that involved 34,347 participants. These studies investigated the connection between telomere length and depression, and some had inconsistent results. In the review, the researchers found that overall, there was a significant association between telomere length and depression. However, a variety of factors, including the depression assessment tools used, the telomere measurement techniques, source tissue, and other medical conditions, had a significant effect on how strong the association was found to be. . This review doesn't tell us which way the association goes, just that there is one. So we don't know if being depressed shortens your telomeres or if having shorter telomeres makes you more susceptible to depression — or if a third factor is affecting both depression and telomere length. But we do know that neither having short telomeres nor suffering from depression is good for your health. So it's vital that you take steps to address both. I've written a lot about treating depression. You can read these articles on my website. To protect your telomeres, be sure you're engaging in healthy habits, including eating right, exercising, and getting enough sleep. These activities can benefit mild depression too. And take steps to minimize stress, which can both shorten your telomeres and worsen your mental health. And if you access the archives, you will find a study that I reported on about 18 months ago. It indicated that taking fish oil supplements was a great way to protect your telomeres. I would recommend Complete Daily Oils as the best way to get all the protective benefits from fish oil. J Affect Disord. 2015 Dec 2;191:237-247. doi: 10.1016/j.jad.2015.11.052. [Epub ahead of print].